We are about two thirds through our season, with our chances of winning any League titles looking on the slim side. We still have a chance at 1st and Seniors levels but need strong finishes and a bit of help from the opposition. This year we have been extremely busy in implementing the up-dated Unified Handicapping Scheme and have started the very long task of re-assessing the SSS of all the courses in BB&O. Shortly we will also be heavily involved in the implementation of a Central Handicap Database once one or two proprietary glitches have been overcome. Our Golf Partnership continues its outstanding work and is used as the role model for all the new Partnerships in the Country. We are seeing some excellent results from the initiatives in place and we hope that this will translate into new golf club members in the near future. Our Club and Coach programme has also been very successful with any number of talented youngsters being identified. All this work cannot be done without the commitment of our team of volunteers, all of whom put in an unbelievable amount of time and effort to develop the Game in the three Counties. Our thanks to all of them. Well done to all the players mentioned in these Jottings and especially to Ashley Walton (Frilford Heath), County Champion for the second time. 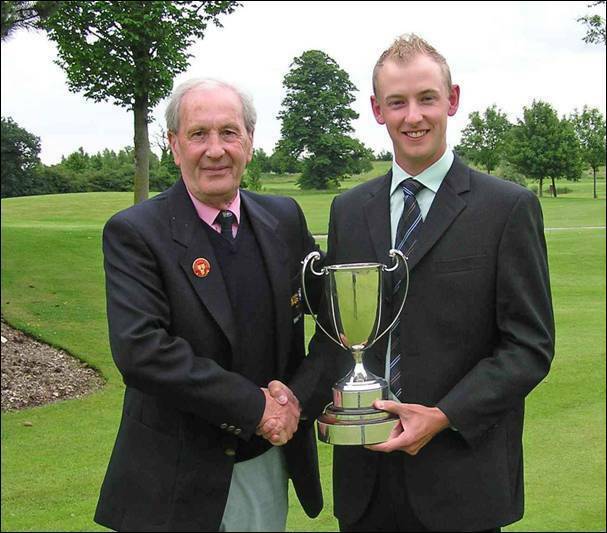 We wish him well in the pursuit of the County Champions’ title at Woodhall Spa later in the year. After our first game against Essex had been washed out we had to wait until 27th July for our opener against Hertfordshire at Porters Park. With both Captains missing a number of players to the English Amateur it gave both sides a chance to test some new blood. On a very hot day we got off to the ideal start winning the first 3 foursomes and only lost the last after the opposition chipped in 3 times. We continued the good form in the afternoon singles and took 6 of the 8 games to win the match 9-3. Team at Porters Park: Adam Birdseye (Hazlemere), Craig Buttivant (Gerrards Cross), Matt Jones (Buckinghamshire), Tim Newton (Reading), Malcolm Reid (Royal Ascot), Ashley Walton (Frilford Heath), Joe Winfield (Woburn), Dean Wright (Reading). Our re-arranged match against Essex took place at Bentley on 10th August. We had high hopes of taking this match after an excellent performance in the foursomes. At one stage we looked like we would win all 4 but a disappointing finish left us just 1 point up at lunch. Again we did not capitalise on a good start in the afternoon and we eventually lost out 4½-7½. We now need a series of results to go in our favour to stand any chance in the League. Team at Bentley: Adam Birdseye (Hazlemere), Carl Corbin (Wokefield Park), Sean Elliott (Frilford Heath), Adam Glass (Caversham Heath), John McNally (Stoke Park), Malcolm Reid (Royal Ascot), Ashley Walton (Frilford Heath), Adam Wootton (Oxford City). At long last a win against the mighty Essex Colts team. Although we know they were unable to field their strongest side we still needed to pull out all the stops to register our first win against them at Harleyford on 1st June. We were even at lunchtime but managed to turn round a number of games, in which we were down, in the afternoon singles to win 8-4. 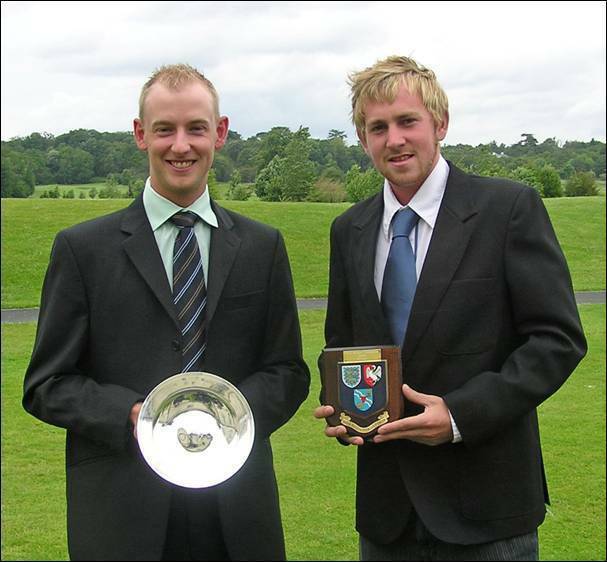 This was our first win against Essex since 2002, coincidently at Harleyford. Team at Harleyford: Brandon Caddow-Young (Mill Ride), Mathew Johnson (Chipping Norton), John McNally (Stoke Park), Tim Newton (Reading), Matt Rendell (Reading), Joe Winfield (Woburn), Tom Wilde (Beaconsfield), Dean Wright (Reading). After a great start to the season we came down to earth with a bang as we lost 5-7 to Bedfordshire at The Millbrook on 28th June. We lost the foursomes 1-3 after looking for most of the morning as if we would be level at least. This proved too big a deficit to pull back and with the honours shared in the afternoon we lost the match. We are still in with a shout for the title as each County has lost at least 1 match. 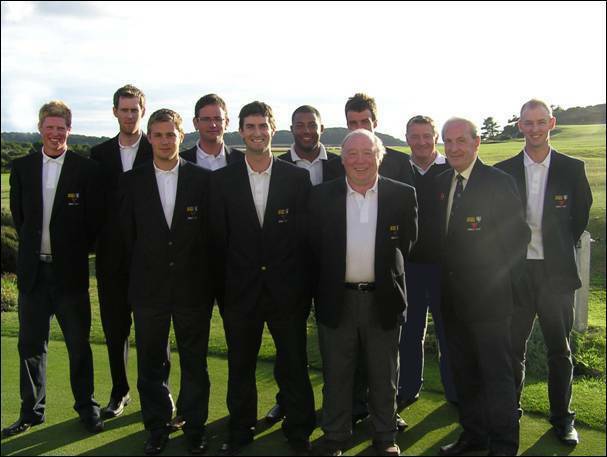 Team at The Millbrook: Brandon Caddow-Young (Royal Ascot), Nick Joy (Hazlemere), Tim Newton (Reading), John McNally (Stoke Park), Ben Patterson (Frilford Heath), Matt Rendell (Reading), Tom Wilde (Beaconsfield), Dean Wright (Reading). We played Bedfordshire and Hertfordshire in this match at Temple on 20th July. This was a nervous time for a lot of the players as it was their first County game. Nevertheless they all enjoyed themselves, which is the main thing. We lost by one point to Hertfordshire and drew with Bedfordshire. Team at Temple U12s: Sam Brass (Castle Royle), David Evans (Woburn), Damien Hewitt (Bearwood), Zac Jenkins (Mill Ride), Seb Jones (Bearwood), U13s: Alex Bruce (Sand Martins), Tom Butterworth (Harewood Downs), Matteo di Carlofelice (Mentmore), Duncan Toms (Reading), Alex Wills (Harewood Downs). On July 29th the team travelled to Aldenham, and despite two defeats by strong Hertfordshire and Middlesex teams the BB&O boys showed some excellent promise for the coming years. 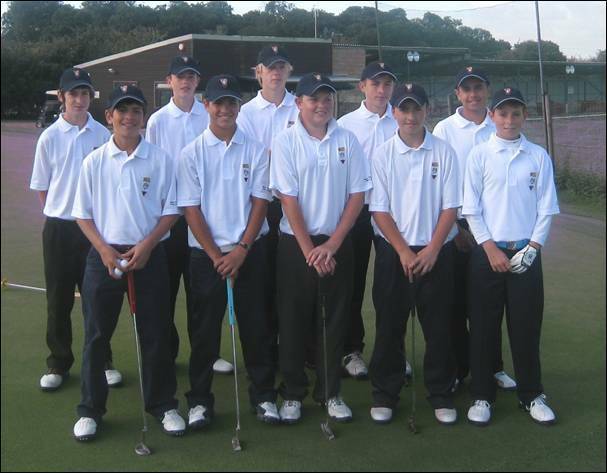 For most players this was their County debut and they handled themselves very well both on and off the course. Everyone enjoyed themselves and were very tired at the end of the day but were all a great credit to the County. Congratulations to Joe Townsend who won both his foursomes and both his singles to gain maximum points and against players whose handicaps were all considerably lower. 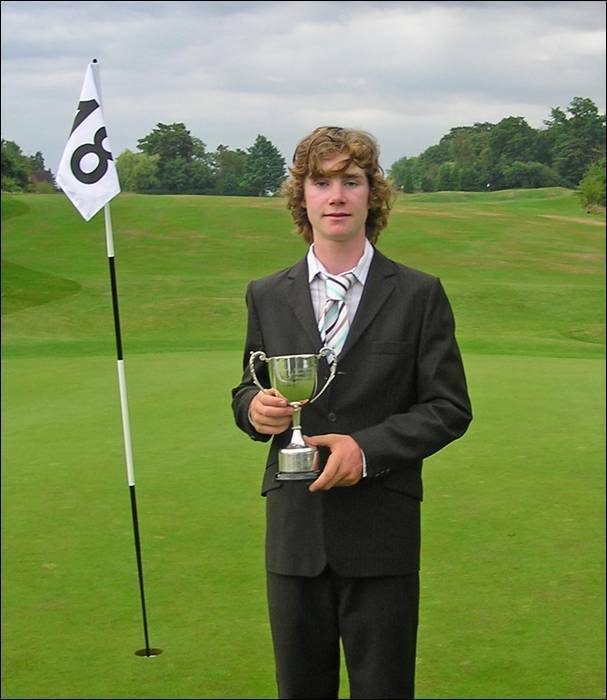 Well done also to the team Captain - Alfie Bull who was unbeaten in the foursomes and notched up a good scalp with a win against the Hertfordshire player who recently won the U14 Boys Scottish Stroke Play Championship. An excellent performance also from Matteo Di Carlofelice who won a foursomes match and both his singles with a very disciplined performance. The Team at Aldenham: Alfie Bull (Beaconsfield), Ben Beach (Burnham Beeches), Alex Bruce (Sand Martins), Matteo di Carlofelice (Mentmore), Will Cooper (Woburn), Luke Fitzpatrick (Beaconsfield), Curtis MacGeever (Newbury Racecourse), Lyle Phillips (Goring & Streatley), Joe Townsend (Burford), Christian Vollaire (Stoke Park). The team played the second match of the season at Hadden Hill on 4th August to another strong Hertfordshire side and a good team from Bedfordshire. We had a clean sweep in the foursomes against Bedfordshire 5-0 but a lack of concentration by our team in three matches on the 9th green left us adrift of Hertfordshire 1-4. We carried on the good performance in the afternoon against Bedfordshire with a fine 8-2 victory in the singles but the deficit on Hertfordshire was too much to make up and we lost to them. Every member of the team scored points on the day and what was particularly pleasing was that some of the players who had difficult results in the previous singles came back to take maximum points. Well done to Christian Vollaire and Curtis MacGeever for showing character and doing just that and also to Will Cooper and Lyle Phillips for their two foursomes victories. Congratulations also to Jordan Williams and David Langley who made their debut for the team with two excellent singles victories and a point each in the foursomes. The Team at Hadden Hill: Alfie Bull (Beaconsfield), Ben Beach (Burnham Beeches), Alex Bruce (Sand Martins), Matteo di Carlofelice (Mentmore), Will Cooper (Woburn), David Langley (Winter Hill), Curtis MacGeever (Newbury Racecourse), Lyle Phillips (Goring & Streatley), Christian Vollaire (Stoke Park), Jordan Williams (Hadden Hill). In the first of our League Matches we had mixed fortunes at Richings Park on 28th May. A fine win against Bedfordshire 10½-1½ was offset by a heavy defeat 2½-9½ to Hertfordshire. Team at Richings Park: George Abbott (The Oxfordshire), Ryan Armstrong (Woburn), James Brockington (Henley), James Cooper (Wokefield Park), James Foster (Newbury & Crookham), Robert Grant (Mentmore), Chris Neville (Newbury & Crookham), Ben Roche (Woburn). We beat Middlesex 7-5 but lost to Hertfordshire 5-7 at Mid Herts on 25th July. Somehow Middlesex beat Hertfordshire 6½-5½ no wonder the Junior Managers were confused! 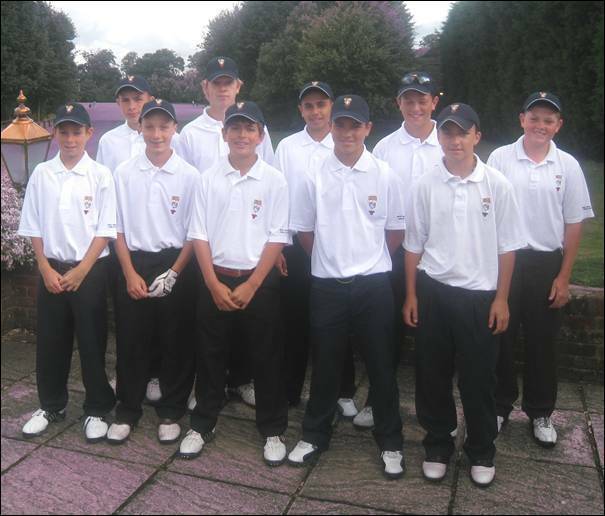 Team at Mid Herts: George Abbott (The Oxfordshire), James Brockington (Henley), Jake Canning (Richings Park), Findlay Ingram (Calcot Park), Jordan Mann (Sand Martins), Dean Newbold (Frilford Heath), Joe Richardson (Frilford Heath), Ben Roche (Woburn). 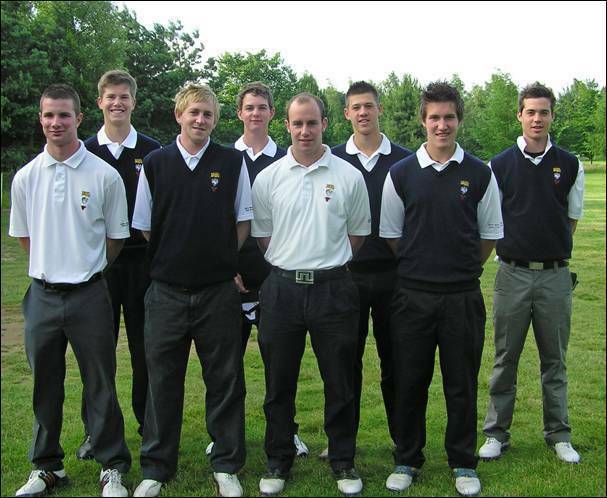 Team at Bedfordshire: James Brockington (Henley), Robert Harry (Frilford Heath), Michael Johnson (Maidenhead), Ben Kirby (Woburn), Dean Newbold (Frilford Heath), Steve O’Connor (Tadmarton Heath), Asa Phillips (Goring & Streatley), Joe Richardson (Frilford Heath), Oli Tite (Witney Lakes), James Tobia (Woburn). We then took on Hertfordshire at Buckinghamshire GC a couple of days later on 27th May. We shared the morning foursomes but had a resounding win in the singles to take the match 9½-5½. 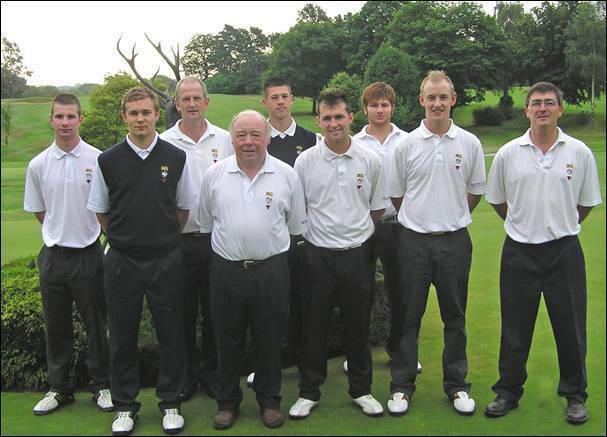 Team at Buckinghamshire: James Brockington (Henley), James Bromham (Richings Park), Robert Harry (Frilford Heath), Michael Johnson (Maidenhead), Mark Kirby (Richings Park), Dean Newbold (Frilford Heath), Asa Phillips (Goring & Streatley), Joe Richardson (Frilford Heath), Oli Tite (Witney Lakes), James Tobia (Woburn). The Seniors opened their campaign with a win against Bedfordshire at John O'Gaunt on 30th June. Despite the absence of 3 key players we were able to call in other experienced individuals from the grey gene pool to still put out a strong team. I can't speak for the others but at least I was under par in my match against one of the top players in the world (in my opinion anyway). Then I get dropped for the next match to make way for David Lane. Team at John O’Gaunt: Bob Clarke (Mentmore), Rod Crisp (Ellesborough), David Doodson (Temple), Neil Franklin (Beaconsfield), Robert Gill (Gerrards Cross), Ian Hunter (Maidenhead), John Summers (Frilford Heath), Tommy Wells (Burnham Beeches), Jim Wilson (Frilford Heath), Peter York (Harewood Downs). Once again we failed to make home advantage count as we lost to Essex at The Berkshire on 7th July. We were doomed after the first 6 games failed to gain a full point and whilst our tail wagged, it was too late, as we went down 4½-5½. We will need to win our last 2 matches convincingly and - you never know - it may come down to my half against Beds which decides the League! Team at The Berkshire: Jim Cameron (The Oxfordshire), Bob Clarke (Mentmore), Rod Crisp (Ellesborough), David Doodson (Temple), Neil Franklin (Beaconsfield), Robert Gill (Gerrards Cross), Nick Moore (The Berkshire), John Summers (Frilford Heath), Tommy Wells (Burnham Beeches), Jim Wilson (Frilford Heath). 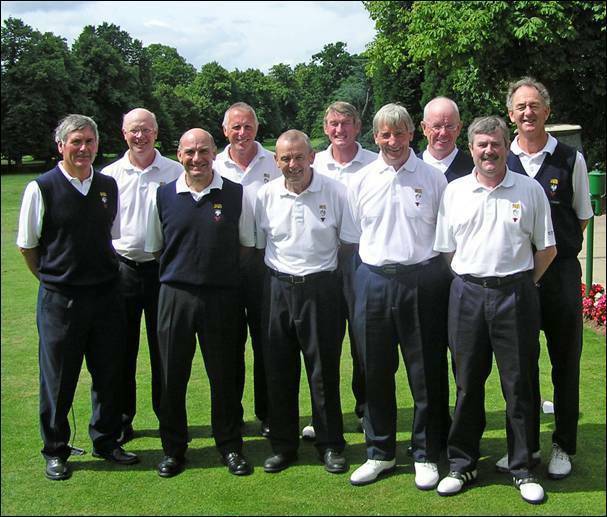 The BB&O Seniors Championship was played at Denham Golf Club on Thursday 15th & Friday 16th May 2008. Play is split over two days and after the Thursday round just 15 players had broken 80 on a damp and breezy morning. Defending Champion John Summers (Frilford Heath) headed the field after a 73 with David Lane (Goring & Streatley) close behind on 74. Gilbert Runnicles (Gerrards Cross) was a further shot back. The second day was set up for an exciting finish with just 7 players in with a realistic chance. The weather improved on Friday but the scoring did not reflect the better conditions. David Lewis (Beaconsfield) set the early pace with a score of 154. As the leaders approached the final holes, John Summers had fallen out of contention after a poor front nine. His playing partner Gilbert Runnicles then took the lead after another solid round saw him finish on 151. It was left to the reigning English, Canadian and Portuguese Seniors Champion David Lane, to utilise his vast experience as he established a healthy lead with 3 to play. Despite a couple of minor errors in the last few holes he was able to hold on to his lead and finished 3 ahead of Runnicles to claim his 9th BB&O Seniors title. Summers took the 55-59 Age Group Trophy, while Runnicles took the 60-65 Trophy. 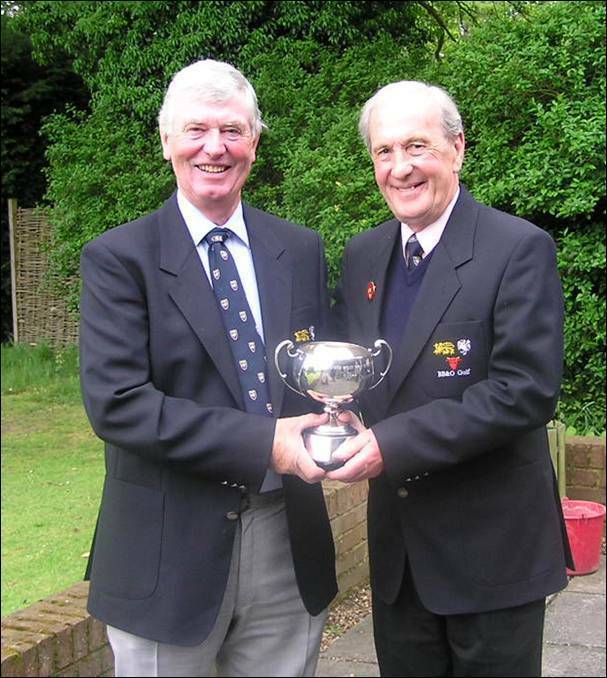 David Lane took the 65-69 Trophy and Bill Perkins (Maidenhead) took the over 70’s Trophy. In the Handicap section the 145 of Simon Tredray (East Berkshire) took first place with Richard Eltham (Maidenhead) in second and Paddy Nolan (Ellesborough) in third. Maidenhead took the Team Prize by 4 shots from Beaconsfield. 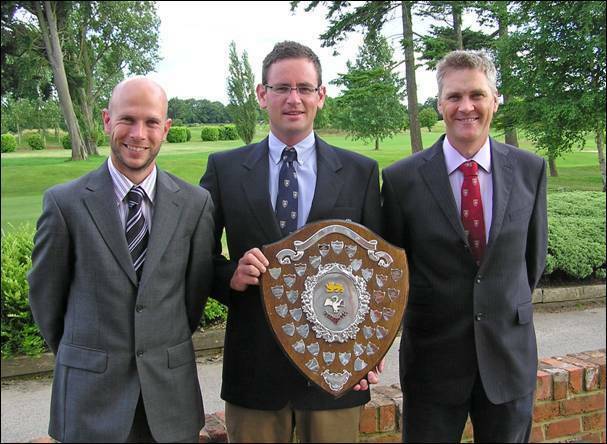 The BB&O Penfold Championship was played at Calcot Park Golf Club on Saturday 17th May 2008. This event also serves as the qualifying round for the BB & O Amateur Championship and the top 48 players and ties gain automatic entry to the Amateur and the next 60 play in the Penfold Trophy for the remaining 23 spaces. There were 109 entries and players of 2.1 and below were entered for the Amateur Championship and players of 5.3 and over were balloted out. Once again a number players ‘forgot’ to enter in time and seemed surprised when their entries were declined. After the morning round Joe Winfield (Woburn) was in the lead after a 2 under par round of 68. Paul Heselden (Harewood Downs) and Harry McCreanor (Datchet) were just 1 behind after solid 69s and there were another 23 at 77 or better. With so many qualifying spaces available there was much debate as to where the cut would fall. Needless to say, once again, the Secretary was to get it right! The average afternoon scores were virtually identical to the morning with 25 players scoring 77 or better, but the best of the day came from one of the early starters - Darren Gatward (Calcot Park) who used his local knowledge to complete an excellent 3 under par 67 for a total of 141. His only real challenger was morning leader Joe Winfield, but he could not quite manage Gatward’s finish over the closing stretch and was to fall 1 short of the target. Harry McCreanor finished a further 2 shots back to take 3rd place. The qualifying score was 155 those up to 156 on countback are reserves for the Championship. The BB&O Amateur Championship was played at Castle Royle Golf & Country Club on Thursday 12th & Friday 13th June. The format for this Championship is the top 48 (based on exact handicap) are entered automatically and there are 24 qualifiers from the Penfold Trophy. The field was competing for just 16 places (and ties) for the final 36 holes on Friday. On the first day Adam Glass (Caversham Heath) posted an excellent 2 under par total of 142 and was soon joined by Tom Wilde (Beaconsfield) who is also a member of Castle Royle. Ashley Walton (Frilford Heath) recovered from a poor morning round to score a best of the Championship 5 under par 67 as he and Sandy Bolton (Kirtlington) finished just a shot further back. Two others were on 1 over par and two more on 2 over par. The County Captain correctly predicted the cut (as usual - he had several guesses) at 150 and 17 players, including 2 from the Penfold Trophy, advanced to the second day. The 3rd round is considered to be moving day and as such, once again, some moved forward and some backward. Ashley Walton - no relation to - and Darren Walton (Woburn) both finished under par and Tom Wilde (Castle Royle) added another solid 73 to his previous efforts. With 18 holes to play Ashley Walton held a lead of 2 from Wilde and 4 from Adam Glass, Sandy Bolton and Darren Walton. After 9 holes in the afternoon it was far too close to call and the lead went to and fro. Another 6 holes still had not given us a clue to the eventual winner but as each came to the 17th tee it was Tom Wilde who held a 1 shot advantage from Ashley Walton and Adam Glass with Darren Walton a further shot adrift. On the 18th tee any one of 5 players still had a chance. This last half an hour proved the most exciting finish for many a year as each player vied for the accolade of Amateur Champion. It was the only past Champion, Ashley Walton, who was able to hold his nerve, as he finished with 3 straight pars. 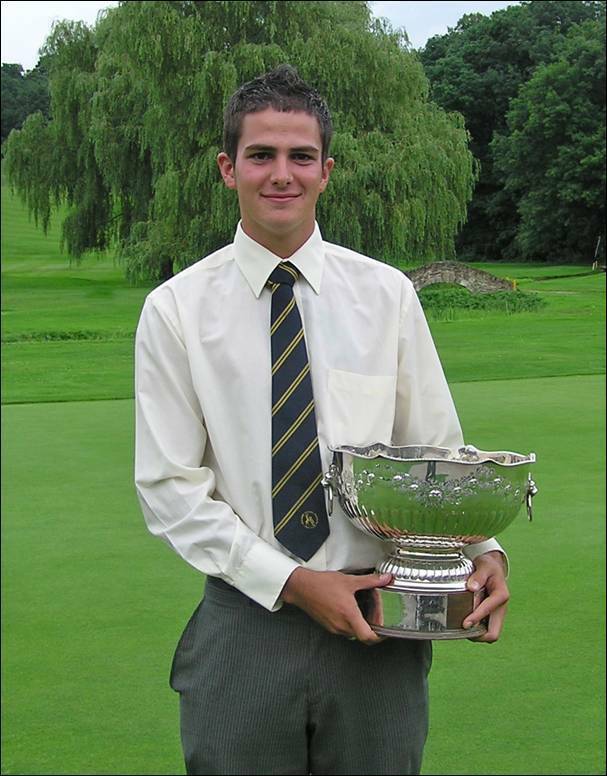 Everyone else dropped at least 1 shot over the finish thus enabling Walton to win his second Amateur Championship with the only under par total of 287. 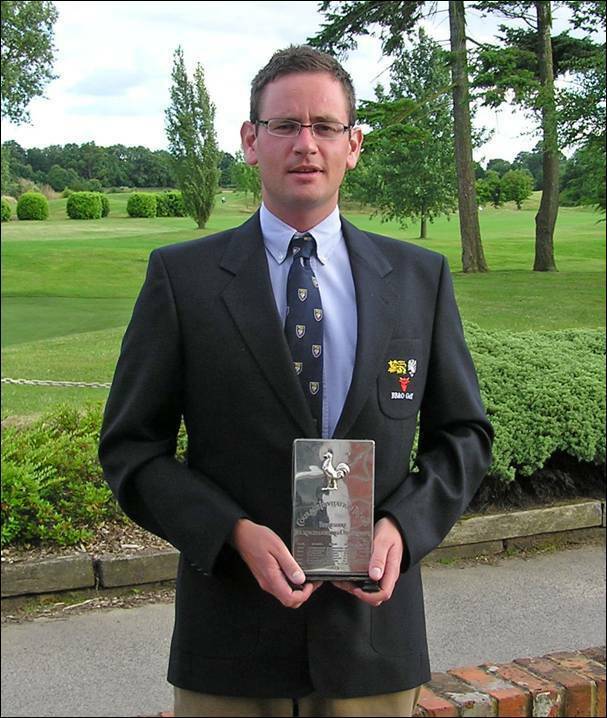 He will now go on to represent BB&O in the EGU County Champions Tournament at Woodhall Spa in September. The BB&O Club Scratch and Handicap Foursomes Championships were held at The Lambourne Club on Wednesday 18th June. This year the format changed in that Clubs could enter two teams and were able to win either, or both, of the Championships. 55 teams were entered and play was in two balls instead of the normal threes. This meant that play was much faster and this appealed to everyone concerned. After the morning round Ashley Walton and Ben Paterson (Frilford Heath), playing off a combined handicap of Plus 1, were the only team to get into ‘red figures’ and their gross 71 net 71½ saw them lead both Championships. They enjoyed a 4 shots advantage in the Scratch from four Clubs tied on 75. In the Handicap Championship, it was a closer call, with their lead just 1 over the Gerrards Cross pair of Gilbert Runnicles and Adrian Donkersley. There were 2 other teams just ½ shot further back and this looked likely to be the closest of the two contests. The afternoon saw the wind pick up and the temperatures were not what you would expect in the middle of June. Consequently the scores did not improve much, although Adam Wootton and Ian Bound put up a real challenge - in defence of the Oxford City title - and had an excellent level par round of 72 to set the Scratch target at 150. However the newly crowned Amateur Champion and his partner continued their steady progress and with a solid 76 were able to take the Title with 3 shots to spare. In the Handicap section Rob Christian & George Schultes of Beaconsfield had set the early target on 149 but the Frilford pair came in with a net 148 to take the lead. Out on the course Colin Lumley and Alan Paterson were playing very steadily again and despite a double bogey at the 14th they followed up with 4 pars to finish with a net 148 and took the Title on countback. The BB & O Champion Club & Courage Trophy were played at Sand Martins Golf Club on Saturday 19th July. The event format changed this year and there is no longer a need for clubs to pre qualify. Also the leading individual player now receives the Courage Trophy replacing the Club Champions and Invitational format, which had proved to be poorly supported. The format is the best two medal scores from three counting both morning and afternoon. 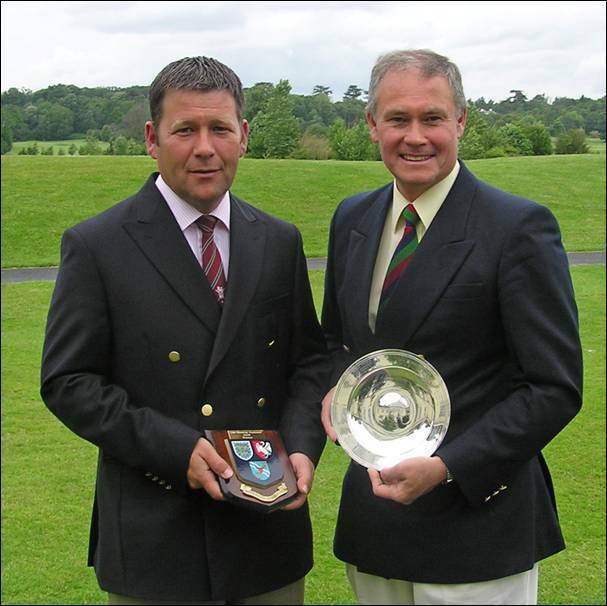 The leading Club goes on to represent BB&O in the English Champion Club Tournament being held at this year at The Wiltshire Golf Club on 29th & 30th August. 19 Clubs took part this year and Stoke Park were hot favourites with a combined handicap of Plus 5 and they finished with a total of 142 in the morning to lead by 7 from Gerrards Cross and 8 from Burford and Reading. The best round of the morning had been the level par round of 70 from Kevin Freeman (Stoke Park), with his club mate Luke Rusher 2 shots adrift. It would be a tall order from anyone to catch the Stoke Park team and as soon as Steve Barwick posted a 69 in the afternoon it was effectively all over. A number of players had scores in the low 70s but could not get any help from their team mates to make a challenge. Stoke Park coasted home, well clear of Gerrards Cross with Mill Ride in 3rd spot. Kevin Freeman added a 71 to his morning effort to take the Courage Trophy by 2 shots from Steve Barwick with Craig Buttivant (Gerrards Cross) in 3rd place. We wish the winners luck in their attempt to become English Champion Club later in the year and hope they can carry on the good work in the pursuit of the European Champion Club title. 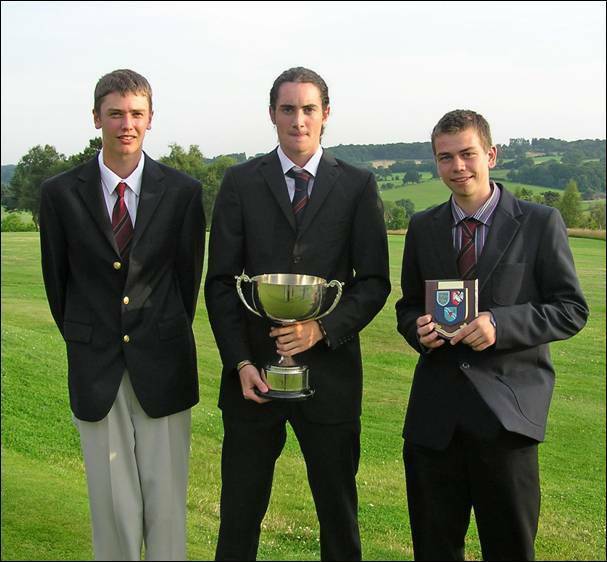 The BB & O Junior Champion Club was played at Harewood Downs Golf Club on Thursday 24th July. Like the Champion Club the event format changed this year and there is no longer a need for clubs to pre qualify. The format is the best two medal net scores from three counting. Players are restricted to 24 for Boys and 36 handicap for Girls. The leading Club goes on to represent BB&O in the English Junior Champion Club Tournament being held this year at Harewood Downs Golf Club on 9th & 10th August. The home team were amongst the favourites with an obvious home advantage and were keen to win as the English final is also at Harewood Downs. They were first out and soon posted an excellent score of 136. This score looked set to stand all afternoon but Reading came close after Kye Machin had a great 69 net 64 but their 3rd card was not good enough in the countback. It was left to the last Club out on the course to make a challenge and the tension was high as we waited for the last card to come in before the winners could be announced. Finally it was Burford’s last 2 players who came in with a net 69 and net 66 to pip Harewood Downs by just 1 shot. All the players were a credit to their respective Clubs and the event was played in great spirit and everyone wished Burford the best of luck in their attempt to become English Junior Champion Club in August. 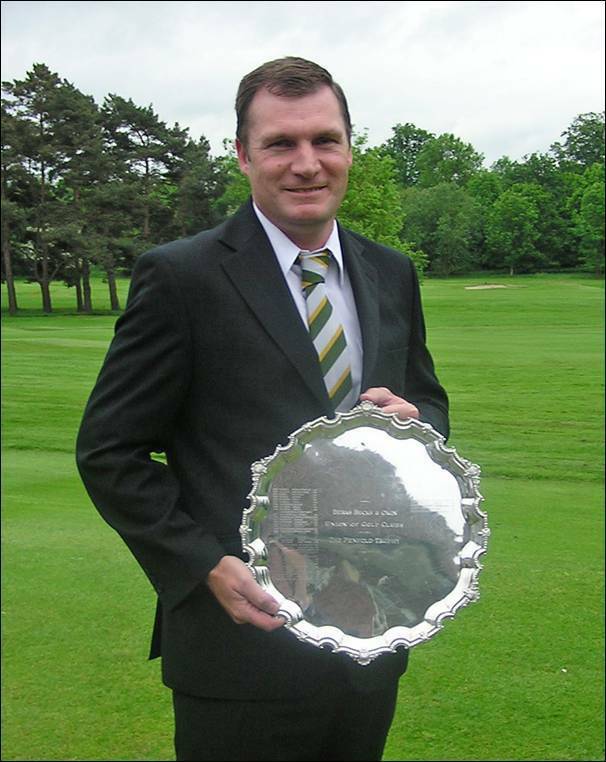 The BB & O Douglas Johns Trophy was played at Harewood Downs Golf Club on Thursday 31st July. This Open event is contested by players aged 15 years and under from all over the Country. It attracted nearly 100 entries and the final field was of an extremely high quality from 58 different clubs, ranging from the far North to the South West. England Boys selectors were on hand to witness golf of high calibre in testing conditions, over the tight par 69 course, which made par or better an exceptional score. Defending Champion Harry Whittle (Woburn), Toby Tree (Worthing) and Mark Collins (Chart Hills) led after the first round with one over par 70s. Josh Stanners (Hazlemere) and Jonathan Grey (Lindfield) were just a shot back and 5 players had 72s and 4 others were on 73. An exciting afternoon was in prospect as the scores were expected to come down once the players had learned the nuances of the course. The early pace was set by Will Chambers (Mid Hertfordshire) after an excellent 69 to leave him at 4 over par for the day. Now only three players out on the course were in contention; Harry Casey (Enfield) had reached the turn in 2 under par and was just 1 over for the tournament. Harry Whittle had dropped a couple of shots on the difficult front 9 and was now 3 over par. The main move however, had come from Greg Payne (Chobham) who had reached the turn in a blistering 3 under par 32. He now stood 4 over par for the day and had suddenly come into contention. After 5 holes of their back 9s Whittle and Casey held a 2 shot lead over Payne but both dropped a shot on the run in. It was Payne who finished with a flourish to birdie the 16th, break the course record with 4 under par 65, to enable him to tie both Whittle and Casey on 141 for the Championship. Once again we had to go to a playoff, cumulative over the first 3 holes, then sudden death if necessary. A fairly nervous start from all three players saw each in trouble at some point on the first hole. Casey’s par put him one ahead of Payne who had missed the green with his second and 2 ahead of Whittle who had disastrously 4 putted from ‘nowhere’. He nearly made up for that with a most magnificent shot from under a tree at 16 to just a few paces but failed to convert the birdie opportunity. Payne holed a long 2nd putt for his par and Casey followed up his opening par with another solid effort. All three hit good tee shots down the last and Casey safely found the centre of the green before Payne hit a great shot to just 6 feet. Whittle’s drive had been too long and he had run through the fairway and under a tree; from where he was unable to find the green and this ended his attempt to be the first person to successfully defend the Trophy. Casey putted stone dead and Payne had the chance to take it into sudden death, but his brave attempt was too firm on the high side and his putt just ran past. Casey tapped in for a deserved victory. A fantastic playoff and - just as importantly - wonderfully supported by Players and Parents, some of whom had incredibly long journeys home. 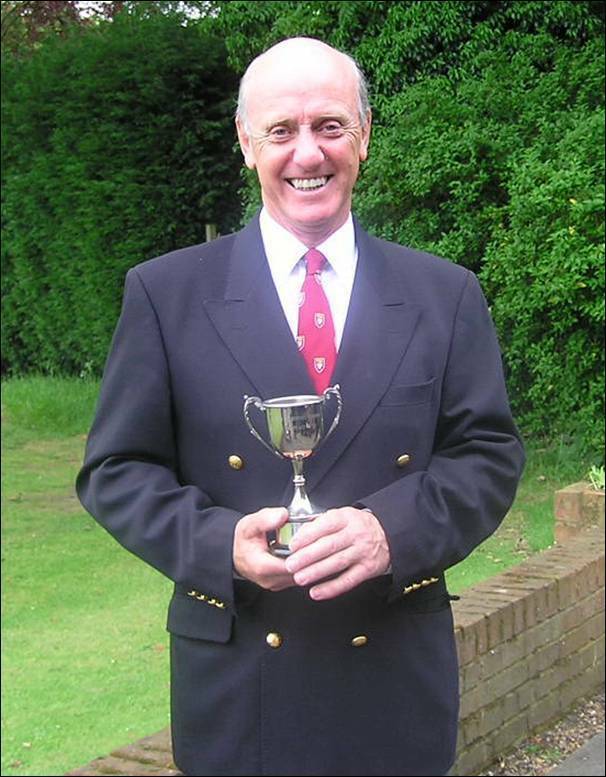 The BB & O Colts and Mid Age Championships were played at Gerrards Cross Golf Club on Friday 8th August 2008. After a few years of disappointing entries to both these championships, it was decided to combine the two and increase the age for Colts to 25. The result was a full field with 42 players in the Colts Championship and 30 in the Mid Age. The course was in lovely condition and in the Colts Championship the morning scoring was very good with 13 scores under 72. Leading the way was Nick Hills (Donnington Grove) after an excellent 3 under par 66 closely followed by Tyrrell Hatton (Harleyford) and Adam Birdseye (Hazlemere). Tom Wilde (Beaconsfield) and David Ford (Reading) were a shot further back after level par 69s. These looked like the only serious contenders for the Trophy in the afternoon. With just 6 holes to play in the afternoon Tom Wilde was 3 under for the day and ahead of the chasing pack. Hatton and Birdseye both picked up a shot in the next few holes and got within 1 of the lead. A bogey at 17th ended Hatton’s chances but Birdseye needed a birdie at the last to tie. His attempt fell just short and found a watery grave to leave him in 3rd place, enabling Tom Wilde to take the title by a comfortable 2 shot margin after a splendid round of 67. Playing for the ‘Busby Bowl’ in the handicap section in the Colts Championship, David Ford’s excellent 2 round total of 135 was just good enough to hold off Dean Newbold (Frilford Heath). In the Mid Age Championship Cliff Pearce (Ellesborough) led after a very solid 1 under par 68 in the morning. Guy Dawson (Gerrards Cross) was just 1 behind with County Champion Ashley Walton (Frilford Heath) and long time County player Craig Buttivant (Gerrards Cross) ominously close after rounds of 70. Buttivant immediately picked up a birdie to make a challenge and despite a couple of dropped shots claimed another birdie at his 14th to finally take the lead. Cliff Pearce was unable to find the birdie he needed in the last 4 holes to tie and he had to settle for 2nd place. Walton’s 3rd place finish saw him consolidate his lead at the top of the Order of Merit and he will be very hard to catch with just 2 events left. 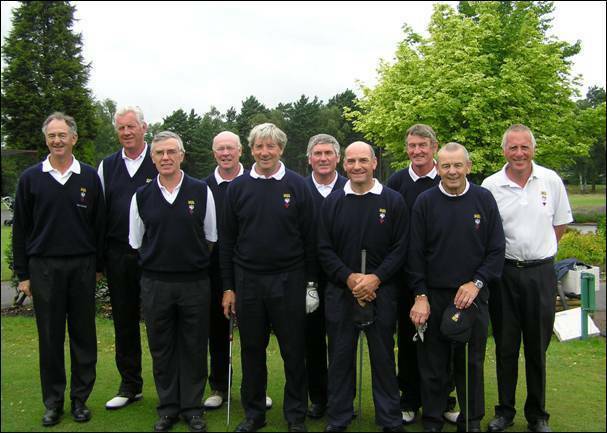 Played at Rookery Park Golf Club on Friday 30th May 2008. Our Team of 6 players were: Eddie Pepperell (Drayton Park), Sandy Bolton (Magnolia Park), Jake Canning (Stoke Park), Tyrrell Hatton (Harleyford), Jonathan Hewitt (Gerrards Cross), Max Smith (Newbury Racecourse). The format is 5 scores from 6 count from each round. Competition Scratch Score was 72 both morning and afternoon. Our players were lying 6th - a very disappointing 16 shots off the pace after the morning round, with the best scores coming from Eddie Pepperell and Jake Canning with 2 over par 74s. The whole field was tightly bunched and we had high hopes of a good finish and to improve our overall position – if only we stuck to our agreed strategy on 2 very difficult holes on the front 9. There were good performances from Tyrrell Hatton, Max Smith, Eddie Pepperell and Sandy Bolton in the afternoon and we raced up the leader board to finally finish 3rd behind Surrey and Suffolk. The number of shots we dropped on the 6th & 8th made the difference between 3rd place and a commanding win. Hopefully we can learn from this experience. Eddie Pepperell won the David Neech Trophy for the lowest overall individual score for the day. Played at Royal Wimbledon Golf Club on Wednesday 25th June 2008. 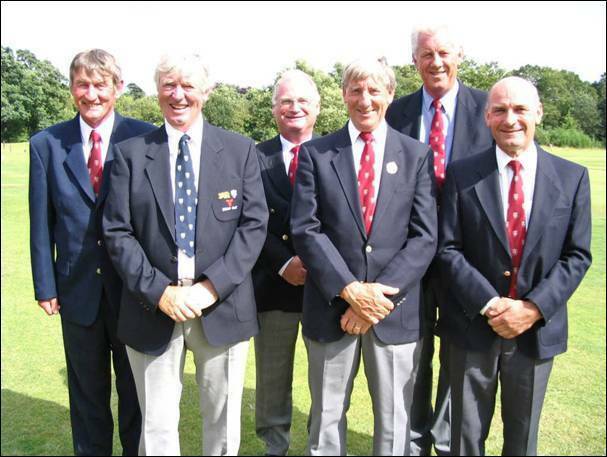 Our Team of 6 players were: Jim Cameron (The Oxfordshire), Rod Crisp (Ellesborough), Adrian Donkersley (Gerrards Cross), David Lane (Goring & Streatley), John Summers (Oxford City), Jim Wilson (Frilford Heath). The format is 5 scores from 6 to count with just 18 holes being played. After 3 years of coming second to Kent we were hopeful for a better result at Royal Wimbledon. The course was quite firm and fast and the predictions were that scores would be high. We could not stick to our game plan of keeping double bogeys off the card and we were never in contention. 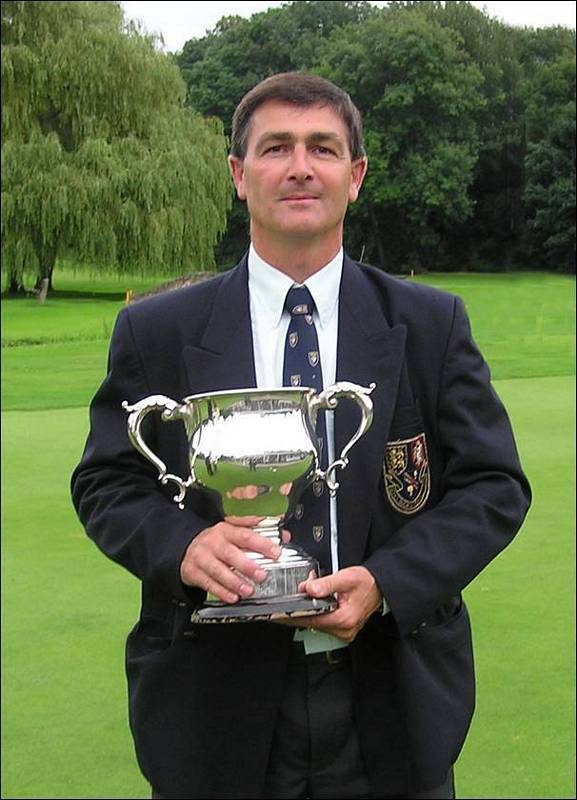 David Lane (Goring & Streatley) had the best score of the day and confirmed his status as the top Senior golfer in the South East. 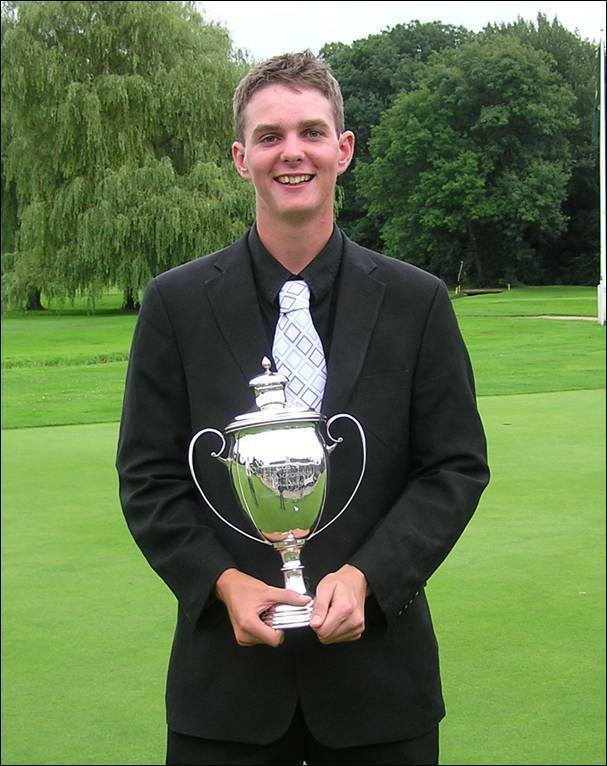 Once again, Kent took the title on countback this time from Hampshire with Hertfordshire a further shot back. Played at Sheringham Golf Club on Saturday 12th July. Our Team of 6 players were Adam Wootton (Oxford City), Ashley Walton (Frilford Heath), Carl Corbin (Wokefield Park), Gregg Blainey (Bearwood Lakes), Kevin Freeman (Stoke Park) & Tom Lawson (Ellesborough). The format is for all 6 scores to count from each round. The standard was extremely high again this year with 50 players with a plus handicap. Kent were the strongest team on paper with a combined handicap of Plus 16, with Hampshire close behind at plus 15. Surrey were next best at Plus 12 and BB&O, Essex and Sussex all on Plus 11. We were definitely in with a chance but would have to perform well all day. However our play in the morning was poor to say the least and by lunchtime we were out of the competition and lying in last place. Hampshire held a 23 shot advantage over us with Kent being their nearest challengers 2 shots adrift. Our afternoon play was totally different with Carl Corbin heading the field with a best of the day 66. Everyone played much better and our total of 422 was the best of the afternoon. From worst to best in just a few hours. An exciting battle took place between Hampshire and Kent with Hampshire just edging home by 2 shots. Surrey finished 3rd with Sussex 4th and we moved up to 5th proving the form book quite accurate. We lost another Past President of BB&O when John Niven DFC died on 30th June. 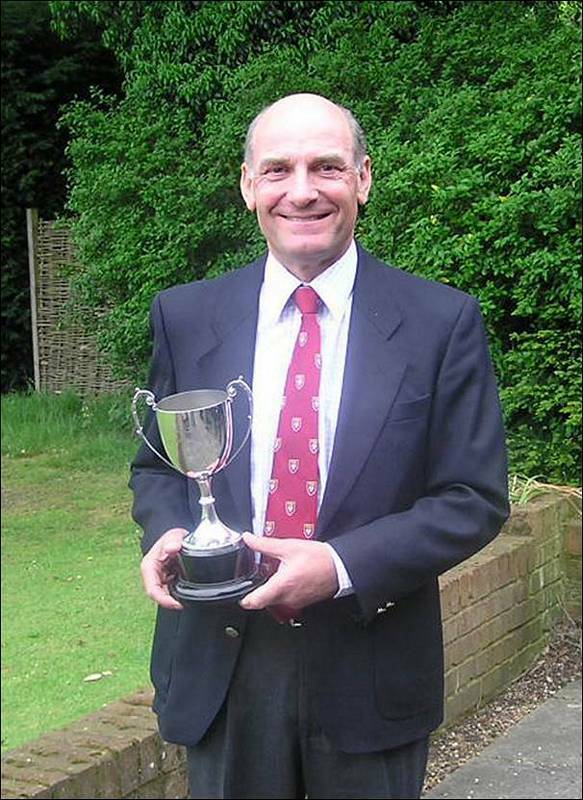 John captained the winning side at the County Finals in 1983 and was President in 1991/1992. 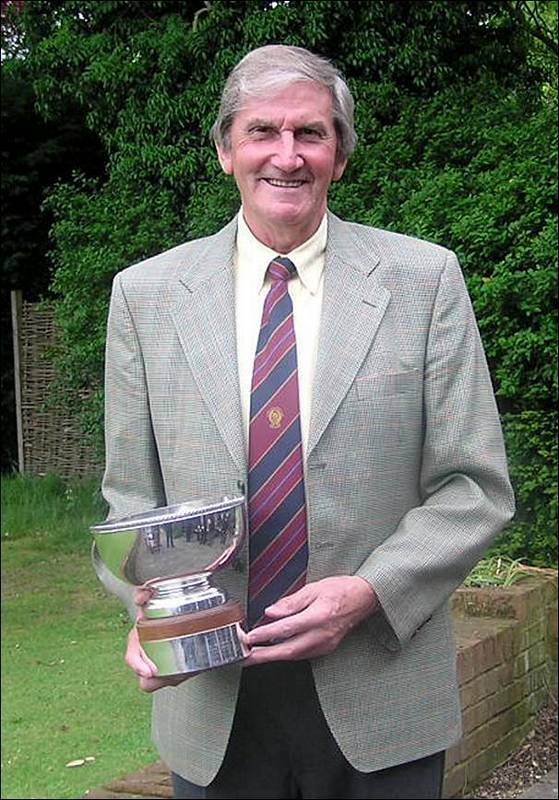 He was BB&O Amateur Champion in 1957, Scottish Seniors Open Champion in 1982 and British Over 65 Champion in 1989. Born in Ardrossan, Ayrshire, he was also a life member of Newbury & Crookham Golf Club and of West Hill Golf Club where he had numerous successes in the Father & Son tournament with David. Not only a gifted golfer John was a bomber pilot during the war and flew more than his fair share of missions over Germany. He was awarded the Distinguished Flying Cross for his skill and bravery.